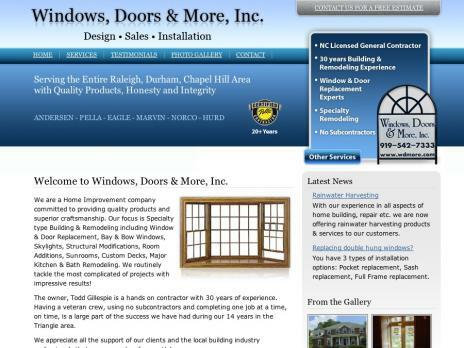 Windows, Doors and More, Inc. is a NC licensed contractor based in Chapel Hill, NC that specializes in Andersen – Pella – Eagle – Marvin – Norco replacement windows and doors and home improvement projects. This entry was posted on Friday, December 3rd, 2010 at 7:36 pm	and is filed under Business, Well Designed Websites. You can follow any responses to this entry through the RSS 2.0 feed. Both comments and pings are currently closed.